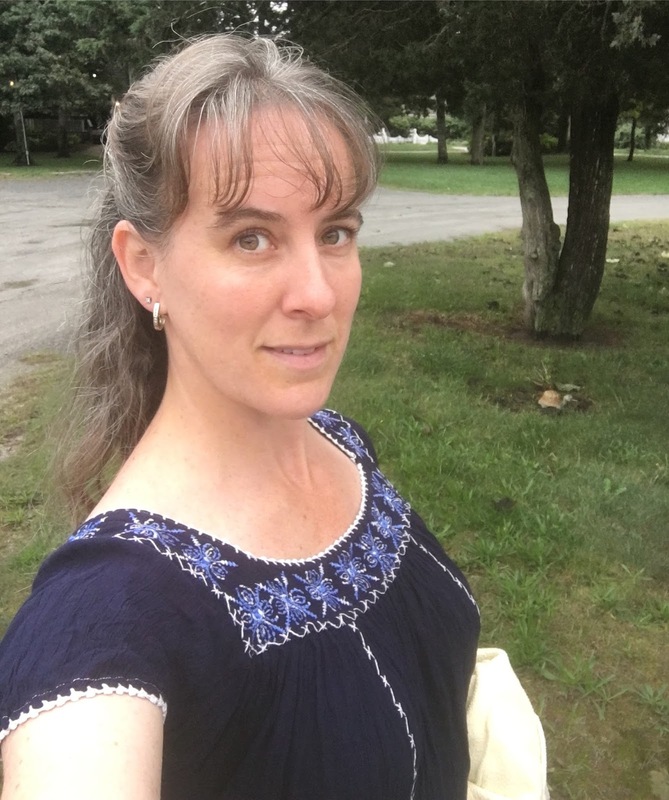 Many moons ago, I bought this flowy, gauzy top and I've worn it to death. I love the color and the embroidery detail and I think I've owned it for well over 15 years, so I know it's not going to last forever. To me, the style is timeless and screams warm weather. It's cool, flowy and very forgiving. And it has a square neck, which I've been complemented on many times over the years. Every so often, I think I need to find a pattern and make some shirts like this because one day, this will really fall apart and then I'll have nothing like it. Much easier said than done. I've looked for years and just when I think I have found a pattern, there's a little something that isn't quite right. Usually, it's that the square neck is really close to my neck, which I don't like. I've discovered that one of our thrift stores nearby has a little sewing area and I've hit the jackpot on zippers, thread and even some bias tape that I thought I'd never use but I've found two uses for recently. All for pennies. 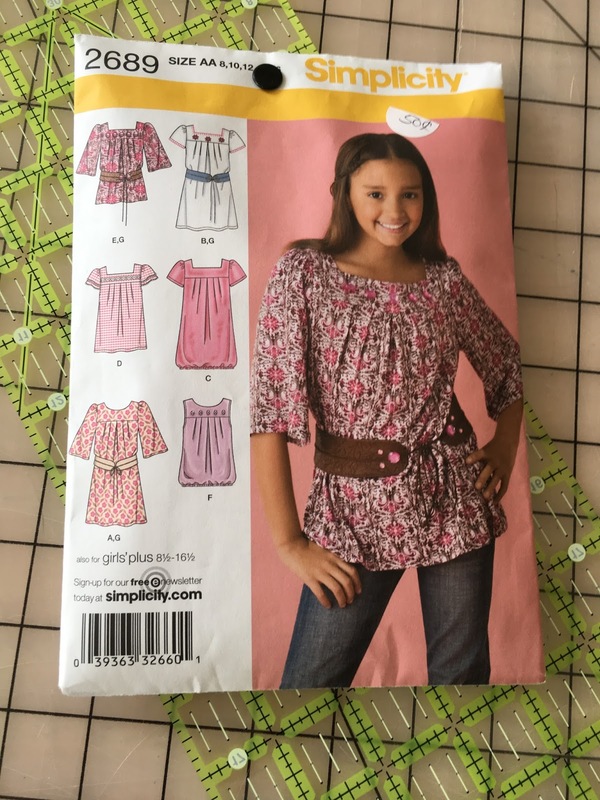 When I saw this girls' pattern for the exact shirt I wanted, I figured 50 cents was a fine price to pay for a pattern that would guide me in the right direction. The first shirt in the second row is exactly what I was looking for. I'm small, and sometimes I could swear I could fit in a girls 14 or 16, but the boobolas usually get in the way. Even though this patter is flowy, I thought it would be too tight across the chest, so I went about making alterations. The pattern pieces had been cut to a 14, and the neck looked kind of small, so I took it upon myself to make up some adjustments that I would probably need to make to be able to have a wearable top. I spent an entire morning drawing, cutting, trying, and when I put it all together, it was way too big. Because I have no idea what I'm doing. I looked at the original pieces again and decided that maybe a 16 would actually have fit, so I redrew my drawings to be what a 16 would most likely have been, based on the way the grading went from the smallest size up to 14. Still convinced my boobolas were going to pose a problem, I added a little extra fabric across the body and cut the seam allowance down to 3/8 instead of 5/8. First lesson: I can cut that extra amount off the back pattern piece or change the seam allowance, for sure. Second lesson: apparently in Simplicity, I could actually fit into a girls 16 without alterations because this is all slight bit looser than I need. There's a fine line between comfortable and baggy. 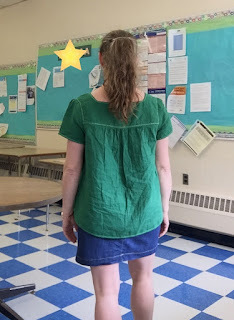 This is a double gauze fabric so it's soft and flowy, but it has more structure than the thin gauze of the original shirt, so it doesn't cling the way the blue on does. Also, it wrinkles like crazy, but I'm ok with that. This green turned out to be a huge disappointment. I thought it was going to be awesome but it's kind of dull. I really needed something to add interest. 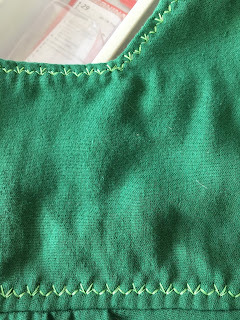 I don't have a super fancy sewing machine, but I do have some stitches that can be sort of fancy, so I chose a lighter green thread and this nifty stitch and went around the yoke, the sleeve tops and edges and the hem. It's not the fabulous embroidery of the original but it gives it interest. Actually, on the hem, I just did a thin hem, no fancy stitch. I loved wearing it so much that I'm on a quest to make a few more. For the next one, I can't decide if I want to use my adjusted pieces and go with a 5/8 seam allowance or if I want to go with my adjustment to a 16 but take out that extra amount I added on the front and back. Also, this skirt is the Chitown Chinos Skirt from Alina Design Co. which is just about the best skirt and shorts pattern I've ever laid eyes on. 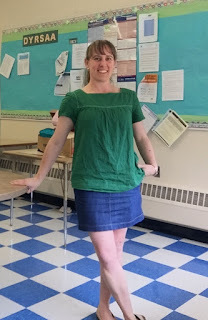 Ok, it's the only skirt and shorts pattern I've ever used, but it's amazing! And, I'm proud to say, this entire top did not have one silly little sewing blunder as almost all of my sewing adventures have had lately! It was super fast to put together once I figured out what pattern pieces to use. Be prepared for a peasant top overload!